Synergy is presenting "Multifaceted GIS Usage in Transportation" at the TU GIS conference in Towson, MD at Towson University. Presenters include Abhay Nigam, Christopher Snyder and Deepti Natali. We plan to show how Synergy uses GIS in its everyday workflow and how GIS is changing the way public/private organizations conduct business in the transportation sector. 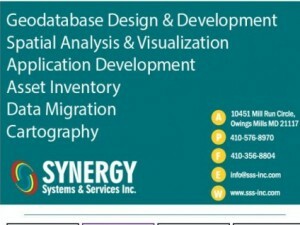 Even though, we will be presenting on the Transportation sector, Synergy has the capabilities to lead and assist GIS projects in any sector. Our presentation will take place at 1pm in room LA3315. We will also have a booth set up in the West Gallery. We invite you to come to the conference and see what we can offer your business! Please click on the link below to see our Conference flyer!